Amador’s accented and animated tenor is a perfect match for Wood’s picture-book biography of innovative musician Juan Garcia Esquivel. The narration is backed throughout by a variety of music and sound effects. These additions give texture to the story and will help young listeners with comprehension, particularly the parts of the book that describe unusual instruments. Once the story ends, the recording includes almost three minutes of Esquivel’s music. The recording is comprised of three tracks: narration with page-turn signals, narration without the signals, and author’s and illustrator’s notes read by Wood and Duncan Tonatiuh. (The page-turn signal is an unobtrusive rustle of paper, and in the track without page- turn signals, listeners are verbally cued to turn to the first page of the story.) Experienced along with the print book, Amador’s reading combines with Tonatiuh’s illustrations for a vivid re-creation of Wood’s writing. This is an outstanding addition to any picture-book biography collection. Brian Amador's narration, space-age music, and a multitude of sound effects come together fantastically in this audio and picture book pairing about the life of sound artist Juan García Esquivel, known as "Esquivel!" Listeners learn of Esquivel's & childhood and love of music, and all the ways he discovered to imitate the world through sound. The audiobook is perfect for children who are interested in exploring the world of making music creatively, as each "boobam," "rooooom," and "blop-bleep-bloop-bloop" leaps off of the page and into their ears. Amador's narration, the lively music and sound effects, and the joyful Mixtec codex-inspired illustrations from Duncan Tonatiuh combine to inspire young listeners. Susan Wood reads her author's note and Tonatiuh his illustrator's note, explaining their interpretations of Esquivel's story. Starred ReviewJuan Esquivel is no longer a household name, but in the 1950s and 1960s, his innovative lounge music was ­pervasive. As a child in Mexico, Esquivel began his musical career by playing piano and soon started matching sound to ­situations. He was a musical artist, using sound like paint, and he recorded many records in Mexico and in the United States. This audiobook version of the picture book biography is magical. Sound effects, mariachi band music, and unusual instruments perfectly blend to support Wood’s text. Listeners are introduced to a theremin, a buzzimba, and an ondioline. Esquivel played with stereo sound and the CD includes original songs performed by Esquivel. 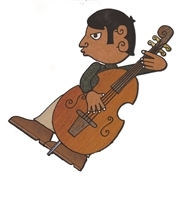 Duncan Tonatiuh’s distinctive illustrations inspired by the Mixtec codex capture Esquivel’s humor and accessibility. The author’s and illustrator’s notes provide more detailed background information for older students. VERDICT Paired with the print book and the online resources found at esquivelbook.com, this is a highly recommended addition to audiobook biography collections everywhere.